Other than by luxury yacht, there are few better ways to explore the Caribbean than on a cruise. 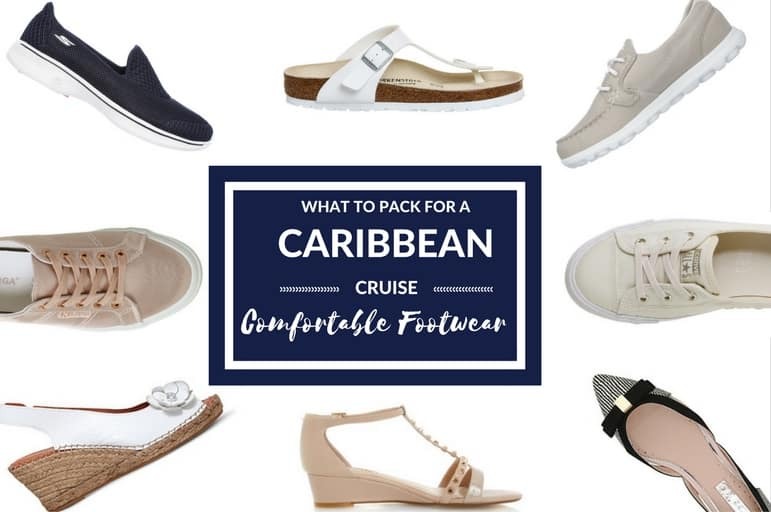 But with a range of activities and onboard events, you may be left wondering just what to pack for a Caribbean cruise. While every island is unmistakably “Caribbean”, they also offer something decidedly unique. One day you might be exploring the roots of reggae in Jamaica, on another you could be simply relaxing on the white sand beaches of Barbados. Then there’s the fun evenings back onboard ship, and formal evenings such as the Captain’s Dinner. All of this means packing for a Caribbean cruise needs some careful consideration. 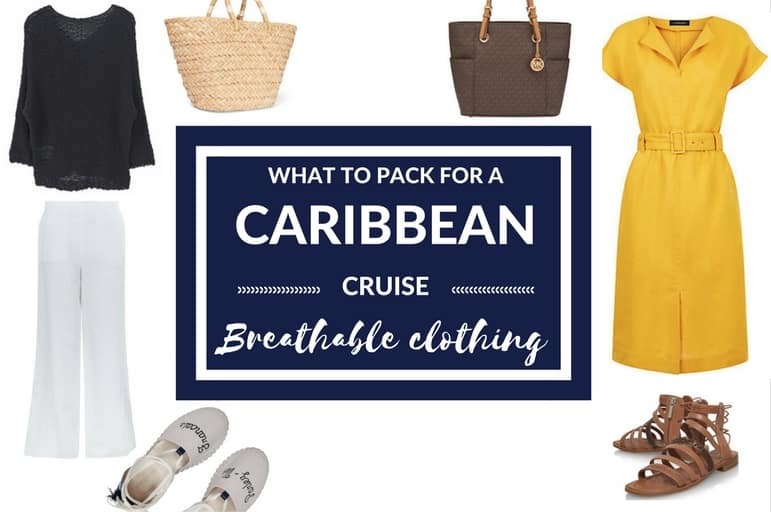 Here are our top picks of what to pack and recommendations on what to wear for a Caribbean cruise, while still keeping your luggage within a reasonable weight. 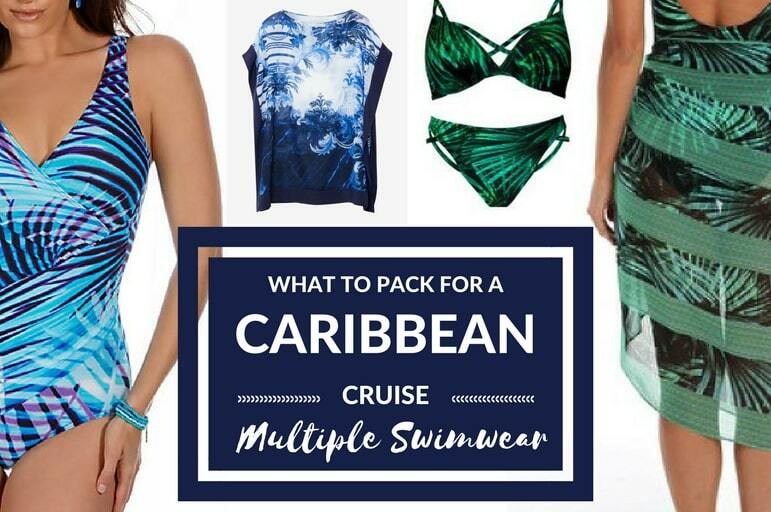 You can find more of our cruise packing tipsIf you have recently set sail on a Caribbean cruise, be sure to share your packing tips in the comments section at the end. Tropical islands can be pretty humid, so the golden rule is to pack breathable and lightweight fabrics such as cotton and linen. If you do find you need a little bit of warmth either onboard or in port, simply add an extra layer of cotton, or a wrap. Don’t forget to add a light cotton sweater into your luggage to wear onboard as the air conditioning can sometimes make things a little chilly. Leave any camouflage print you may have at home – it’s illegal to wear it in some regions of the Caribbean. Planning beach time, or pool lounging action on-ship? Pack at least two swimming costumes so you can rotate them. You may also want to mix it up a little with a one piece for activities like watersports, and a bikini for laid-back lounging. And you can’t go wrong with a sarong. It’s light and easy to pack, but we recommend you also pick one up in port, for handmade beach wear in a print you won’t find elsewhere. A sarong can also double up as a beach towel in a bind – if you don’t want to have to take one with you off the ship. Many of the Caribbean’s islands,such as St Lucia and the Dominican Republic, feature hilly and mountainous interiors. 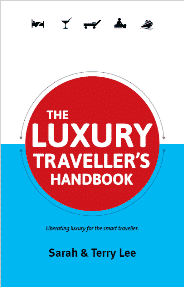 If you have booked a tour to explore such areas, comfortable footwear is essential. Opt for neutral shoes or trainers which will coordinate with most of your outfits. Those that feature a comfort or memory foam foot bed will deliver all day, on the go comfort. Then consider flat, wedged or mid heel options for day to night transformation. Most cruise lines have a formal dinner onboard at least once a week. 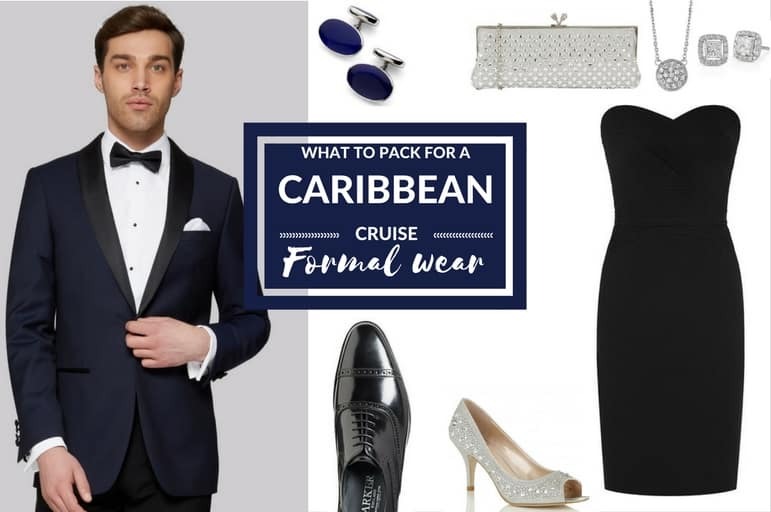 To dress for the occasion, providers such as Cruiseline Formal allow you to rent a tux and have it delivered direct to your stateroom on larger liners such as Carnival and Celebrity ships. Certain brands also offer their own black tie service on board, making for a hassle-free, no-fuss way of dressing for the occasion without having to weigh down your case. Women can opt for a chic, black cocktail dress as a staple which will afford you multiple wear options by switching out your footwear and accessories. Contrast with some vibrant jewellery and matching accessories. 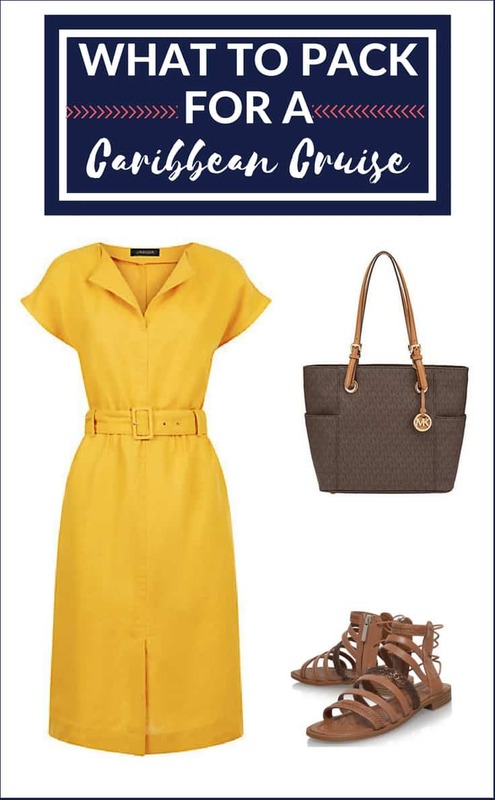 Browse the duty free shops onboard, or pick up some one offs at one of your island stops, where duty-free stores and local craft stalls will throw up some luxurious pieces at a fraction of the price, or unique local finds you can treasure from your travels. Stopping in St Thomas? It’s widely considered one of the world’s best duty free shopping destinations, so head for Main Street in Charlotte Amalie to search for that key piece of jewellery. Clockwise from left: jacquard jacket and trousers, Moss Bros; oval cufflinks, Aspinal of London; Zilar silver clutch bag, Lotus; 14 carat white gold diamond necklace and earrings, Grand Jewellers St Thomas; black strapless dress, Reiss; Serenity peep-toe shoes, Lotus, Barker Wilton shoes, John Lewis.